Suddenly, an annoying little thought started to tug at the corners of my mind. They don’t need to be sitting up straight, furiously taking notes, to hear God’s message. 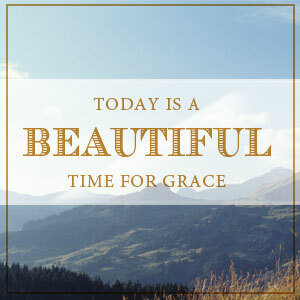 This is a beautiful time for grace. And when you give grace . . . you won’t come unglued. Indeed, grace was exactly what was needed in that moment. And that’s what makes this parenting thing so stinkin’ hard. There are really no textbook answers. Only God can prepare me with the wisdom and discernment necessary for each and every potentially unglued parenting moment. Excerpted with permission from Unglued Devotional by Lysa Terkeurst, copyright Zondervan.